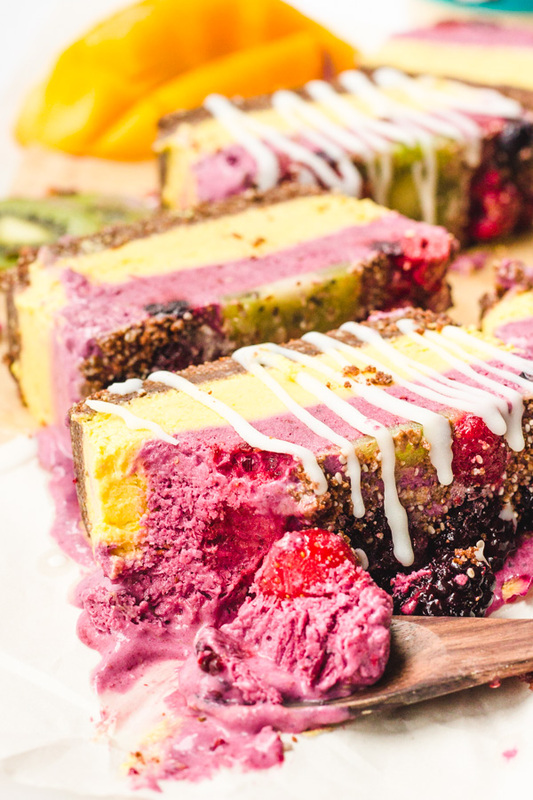 Okay let's talk about this (no bake) very berry and mangoooo frozen fruit cake... or frozen cheesecake? 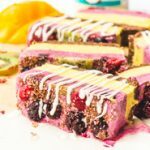 frozen fruit bars? frozen kinda-like-ice-cream-but-not-really? Okay here's the thing. I don't want to call this a cheesecake, because, it's not. It's not super creamy and fluffy like cheesecake. and I won't call it ice cream, because, this really isn't ice cream either!!! If you are looking for ice cream though, definitely check out this four-ingredient vegan papaya ice cream recipe, so good. It's full of so many flavors bursting in your mouth.. all.at.once. A little bit of sour from the mixed berries, along with a little bit of sweet from the mangoes, creamy, melting-in-your-mouth goodness. Oh, and let's not forget about the raw vegan crust, the chocolate-almond-date-sweetened crust that will make you want to eat it straight out of the food processor. But don't because then you'll run out and won't have any for your actual dessert! Which tastes amazing, did I mention that already? Now, let's talk about what makes this uber creamy. We don't use oils around here, right? So the next best thing to make frozen treats uber creamy is coconut milk from a can! Very important step. Do not attempt with coconut milk from a carton. I mean you can, but the result will probably be a tad less creamy and more icy. I use light coconut milk and that helps cut out a bit of the fat content, but if you are searching for super super creamy (and less icy) then definitely try it with full fat coconut milk (but remember watch the fat content!). for your very own enjoyment because you want something cold and refreshing and sweet that you can enjoy for breakfast, but also after dinner because, no guilt here! when you're being kinda lazy, and don't want to bake, so the next best thing is a no-bake raw vegan dessert like this one! or when you've got a ton of fresh fruit like mangoes and berries that are going to spoil if you don't use 'em asap. Don't be afraid of letting this melt a little bit before biting into it. It's sooo good slightly melted and tastes extraaa creamy this way!! Check out this homemade four-ingredient papaya ice cream recipe or this iced golden milk latte made with turmeric! Mixed berries meet sweet sweet mangoes in this delicious frozen fruit cake that is perfect for summer – oh, and that crust has chocolate, too. So yum! Refined sugar free | Refined oil free | Gluten free. Begin by making the chocolate crust – Add almonds, cashews, cacao powder, dates and salt to food processor, and process until you have a sticky dough-like mixture (usually once the mixture begins to stick along side the walls of the food processor it means it’s ready.) If it is still very crumbly and not holding together then process a little bit more but be careful not to over-process. Using an 8×4 loaf pan, (like this one or something similar – affiliate link), lined with parchment paper, press the sticky dough-mixture along the bottom of the pan until you form a crust. Set aside. Make the filling – Add cashews, coconut milk, lemon juice, apple cider vinegar (optional), vanilla extract, dates, and salt to your blender and blend until smooth and creamy. If you do not have a really powerful blender you should soak your cashews for a few hours (or overnight) for ultimate creaminess. If using vitamix or similar blender, no need to soak. Pour out half of the blended mixture and set aside for now. Add mangoes to the blender and blend until smooth. Add mango filling to the loaf pan (on top of crust) and set in the freezer for 15 minutes, or until semi-solid. Now make the berry filling – Add the other half of the mixture (that we separated earlier) back into the blender (no need to rinse blender) along with the mixed berries and blend until smooth. Once the mango layer is a bit solid (around 15 minutes), add the berry layer on top of the mango layer and set back in the freezer. If adding fresh fruits on top, let the mixture set in the freezer for a few minutes and then add toppings and let freeze completely. Freeze for 4 to 6 hours, or preferably overnight. Once ready to serve – let thaw a bit, cut into bars, and drizzle coconut butter on top. Keep left overs in the freezer. I don’t usually soak my cashews because I use a vitamix and the result is really creamy and smooth, however, feel free to soak cashews for a few hours (or at leasttt 30 minutes at a minimum) for ultimate creaminess if not using a high speed blender. I always use light coconut milk from a can, and I am happy with the results, and it is less in fat (healthier option) however, feel free to use regular coconut milk for a creamier finish. Wow, this is one delicious looking fruit cake! Really love the healthy twist on this fruity dessert. These look absolutely gorgeous with the colourful layers! This looks so delicious! Love the different layers! This looks so good! Mangoes and raspberries are such a delicious combination, and I love the addition of the chocolate crust.